My decision to make films comes from a social concern, so I wanted to know and use the image in movement to try to give other people critical and reflective options about the human rights violations that we live in Colombia. The cinema is social - for this reason the production of this film involved a lot of young people from neighbourhoods in roles of assists in the crew, and especially neighbours where the scenes of the film were recorded, in these neighbourhoods we performed for a year and medium a series of artistic activities and cultural promotion, spaces that triggered and activated the interest and participation of the community in the production of the film. Our silence is a collective creation process in which several artists intervene from the writing of the script until its completion. 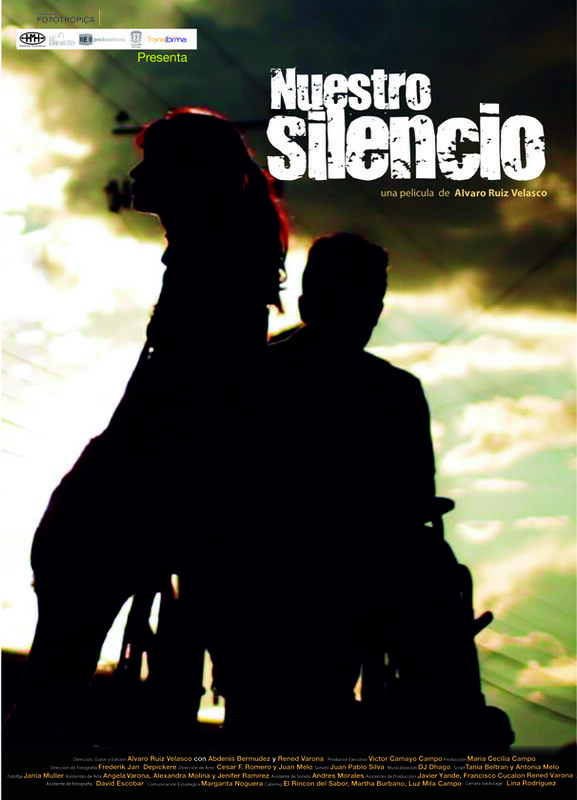 The film is inspired by the survivors of the armed conflict in Colombia, is based on real events and supported by an investigation made in the peripheral neighbourhood where it was filmed, with relatives of missing persons and people executed in so-called "falsos positivos." (BlackFlag). In this film, my Opera prima, I have consolidated a series of elements that I have developed previously in my other short film and documentary projects, so we work with an open script interpreted by natural actors, photographically we use natural lighting and in terms of editing , in some scenes, we use image superimposition's characteristic of video art, but I think that what I learned most during this shoot was to trust, even more, the error. The best fun of the filming of the film was to live with the crew in the house of the producer, Victor Camayo, who in addition to cooking gastronomic delights for all of us, organised filming sessions, his house was our center of operations and fun . A beautiful anecdote is that in the neighbourhoods where the movie was recorded there are horse-drawn wooden carts, called Carretillas, used to transport heavy loads. So our means of transportation were the horse-drawn carts that took us from one place to another, crossing neighbourhoods to continue filming. The need of the human being to categorise everything, in this case, art is one of the areas that allows escape to this universal logic of this world. From the south we already come without rules making art, we encourage that in other latitudes there are movements that liberate and give greater autonomy to communities and peoples, offering tools for the struggle for audiovisual sovereignty.